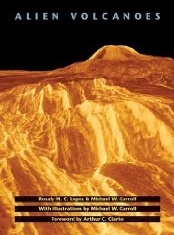 Rosaly Lopes and Michael Carroll have co-written a book which explores volcanic activity in our solar system. This includes volcanoes - past and present - which can be found on planets, moons and asteroids. The authors have skillfully combined a dynamic, easy to read style with great attention to detail. Carroll illustrated this book and it's replete with beautiful artistic renditions. These are complemented by images from NASA and ESA. The reader flows through the pages admiring Carroll�s artistic talent as well as the images returned to us by the myriad exploring craft dispatched into the outer solar system for this purpose. Alien Volcanoes is a classic and a treasure for astronomy buffs, students and family members, even youngsters will enjoy this book. An added treat is the book's foreward, written by the late great Arthur C. Clarke.